CADsoft Consulting Inc., a proven leader in the implementation of design and construction technologies, is excited to announce its showcasing advance design technology this week in San Antonio, Texas, at The Associated General Contractors of America (AGC) premier construction convention being held March 9th-11th. 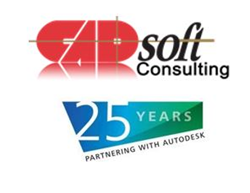 CADsoft has long been a premier provider of advanced construction technology, helping professionals within the industry harness the full power of design solutions to accelerate construction and owner operations with the latest technology and a collaborative process. CADsoft is presenting solutions on scanning for “as built” conditions, Robotic Total Stations from Topcon, and Autodesk BIM360 Docs, a comprehensive, cloud-based service for the construction industry that provides a virtual workspace to create, access, maintain, markup and share 2D and 3D project documents, plans and models. Plan to stop by exhibit booth #G at the Solutions Expo. For more information, visit the AGC convention website. Autodesk, the Autodesk logo and BIM 360 are registered trademarks of Autodesk, Inc., and/or its subsidiaries and/or affiliates in the USA and/or other countries.